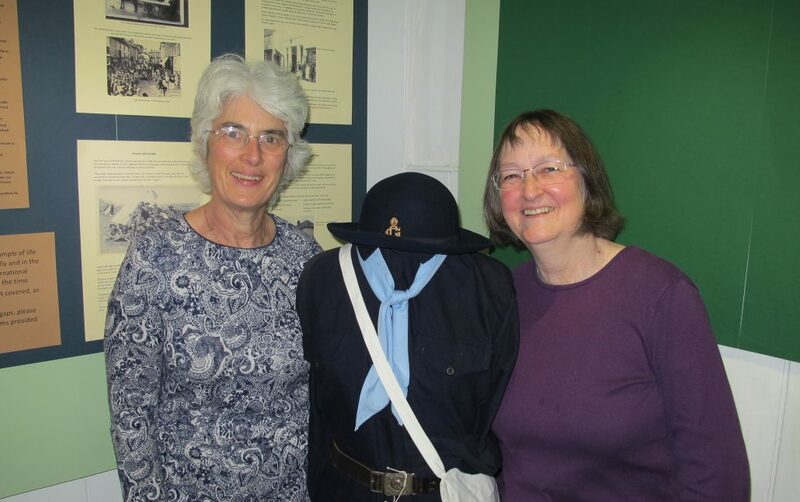 Claire Ryley (left) and Ann Symons are staging a “Shaftesbury Remembers the Great War” display in the Large Exhibition Room at Gold Hill Museum. This charts the progress of the Heritage Lottery Funded community project collecting evidence about the impact of the First World War on the people of Shaftesbury and surrounding villages in Dorset and Wiltshire. Currently on show are information about the men and women remembered on local war memorials; maps and lists of early twentieth century shops and businesses in Shaftesbury; and objects recently donated or loaned to the Museum. The contemporary Girl Guide uniform has been kindly loaned by the Dorset Girl Guides Association. Project volunteers have interviewed many people at the Museum, in their homes and at Shaftesbury Library, and the recordings are being shared with the county archive at Dorset History Centre. A database is being created which will eventually be accessible through Gold Hill Museum website. The exhibition runs until 31 October and the project continues for the rest of 2016. Claire and Ann would love to hear from people who can share objects, information or family stories about the local area in the early twentieth century, and they can be contacted via education@goldhillmuseum.org.uk.